SPENCER CO. -- Indiana Conservation Officers are reporting that the body of a man who went missing in a small private pond in Spencer County has been recovered. Robert A. Hardy, 65, Tennyson, and two others were on a small paddleboat checking a trot line at a private pond. The boat overturned and all three were thrown into the water. The other two were able to make it to shore, but Hardy went under water. 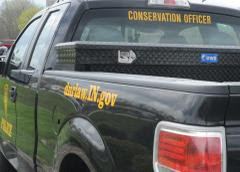 At approximately 5:18 PM, an Indiana Conservation Officer diver recovered Hardy in approximately 8 ft. of water and he was pronounced dead at the scene. Responding agencies included the Spencer County Sheriff’s Department, Indiana State Police, Spencer County EMS, Spencer County EMA Water Rescue, Spencer County Coroner, Jackson Township Fire, and Indiana Conservation Officers.